“Don’t you just crave for a bowl of Bibimbap on a day like this?”. Yes, I do! “A day like this” has been in Poland for over 4 days now – it’s been raining since last week! 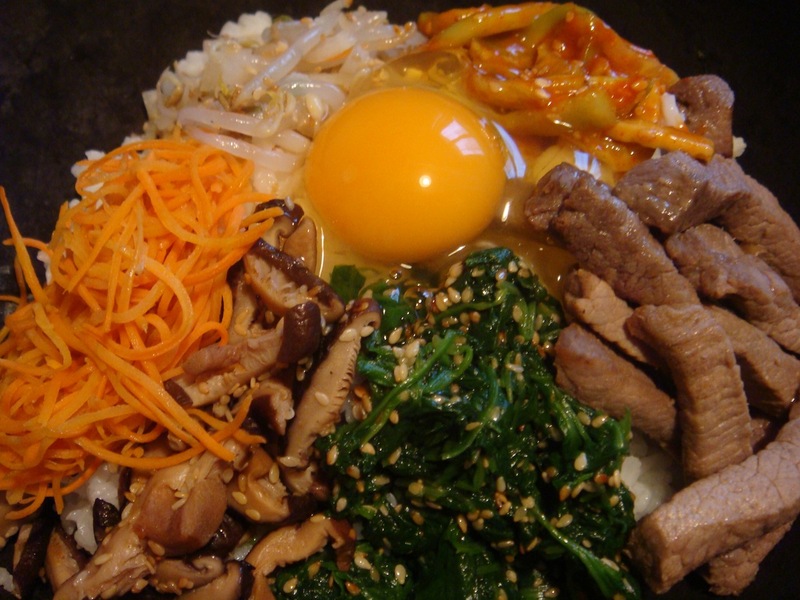 Bibimbap 비빔밥 literally means mixed rice and is one of the most representative dishes of Korean cuisine. It was first mentioned in an anonymous cookbook in the late 19th century. 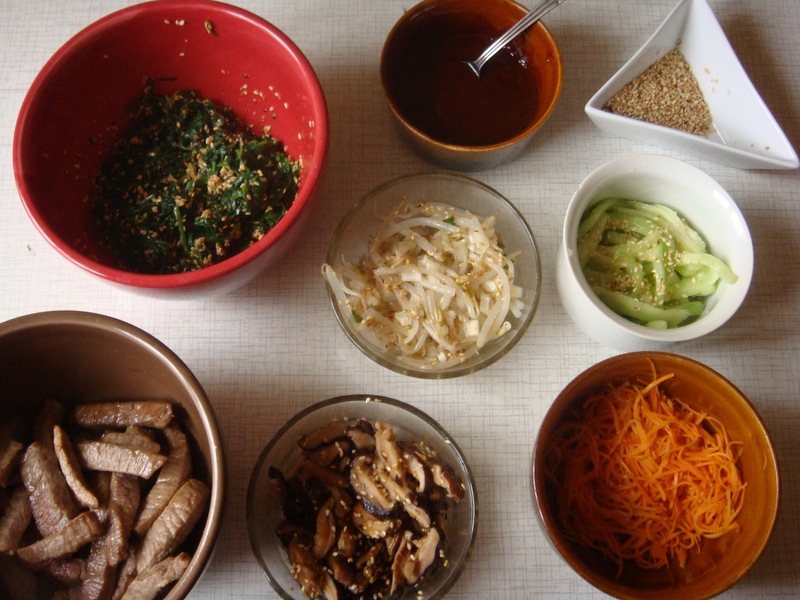 Thanks to its wealth in nutrients, low cholesterol and fat, Bibimbap is the perfect dish for health conscious individuals. The recipe looks long, but is really pretty easy to prepare. First you need to prepare the toppings. 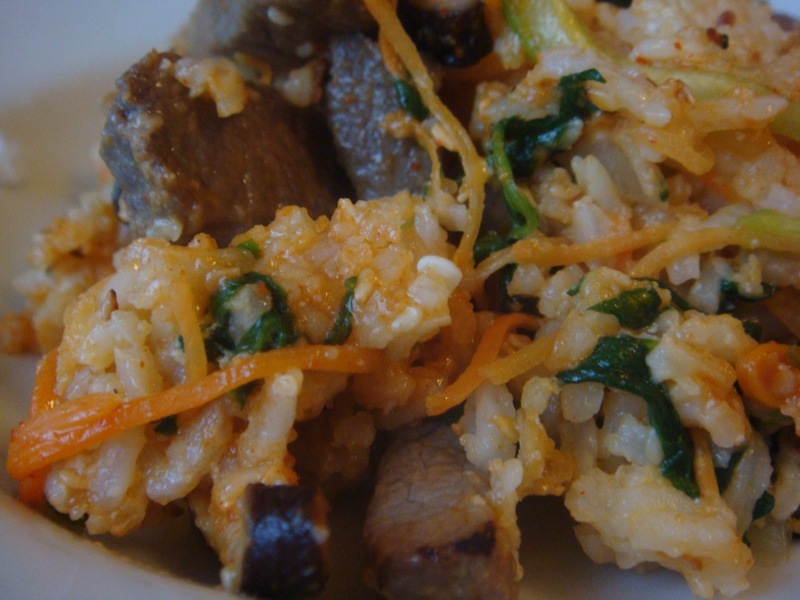 Those used in the recipe are: beef, carrot, cucumber, shiitake mushrooms, spinach and soybean sprouts. 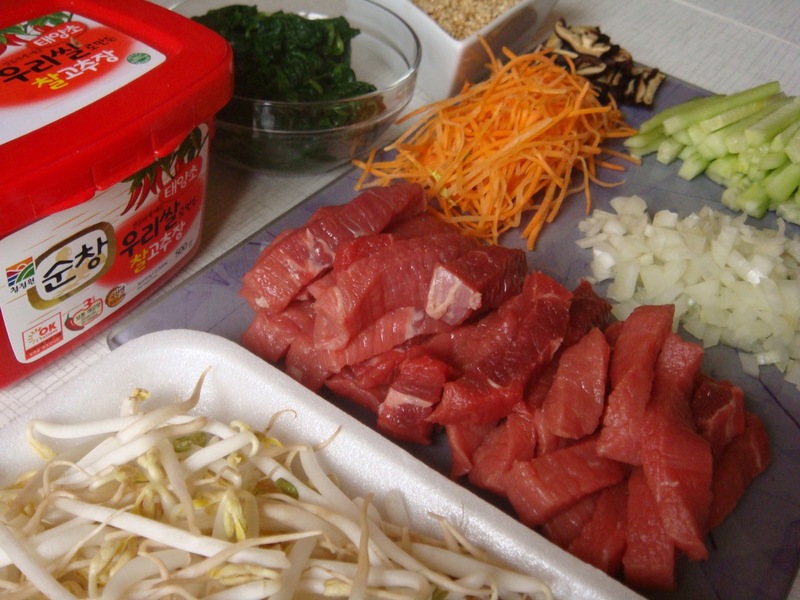 Mix the ingredients and let beef to marinate in them for about 15 minutes. Then fry the beef on a pan for 2 minutes. 1 tablespoon of sesame oil. Heat the sesame oil in a pan, add carrot and salt and fry for about 2 minutes. 1 tablespoon of toasted sesame seeds. Mix cucumbers and salt in a bowl. After 5 minutes, squeeze cucumbers, combine them with the dressing and sprinkle the sesame seeds. To make the Tangy Red Pepper Dressing, mix 2 tablespoons of Korean red pepper paste, 1 tablespoon of rice vinegar, 1 teaspoon of honey, 1 tablespoon of water and 2 teaspoons of sesame oil. Combine water and sesame oil in a pan and fry mushrooms for about 5 minutes, until they’re ready. Sprinkle on the sesame seeds. Put spinach into a boiling water and cook for 1 minute. In a colander, rinse spinach in a cold water and squeeze the water out. Cut it into 5cm pieces. Add the sesame seeds, salt and sesame oil. In a pan, combine the water, salt and soybean sprouts, bring to boil and stir for about 5 minutes. Put the sprouts into a bawl and mix it with green onion, sesame seeds and sesame oil. Now you’re ready to make the last step. Put a pot on a heat and add 2 tablespoons of sesame oil. Add a cup of cooked rice. Cook it until it gets brown on the bottom. Put the toppings on top of it, grouping each one. Place an egg in the center, mix it well and continue heating for another 2 minutes. Serve with the remaining Tangy Red Pepper Paste.